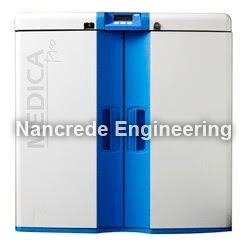 Nancrede Engineering is proud to carry ELGA’s MEDICA line of water purification systems in Indiana, the Midwest, and nationally. Clinical analyzers must receive a reliable and constant supply of compliant water to attain accurate and reproducible diagnostic test results. Water quality below accepted standards disturbs test chemistry and the general operation of the analyzer, thereby reducing result accuracy and increasing reagent costs and calibration times. Experience gained from 75 years of innovating water purification technologies, Elga works in partnership with major clinical diagnostics companies, who have helped design their unrivalled MEDICA range. Compact, reliable water purification systems, with built-in wrap-around reservoirs, occupy a small amount of precious lab space. The MEDICA range ensures bacterial control and optimal purity, as well as an uninterrupted workflow, and is constructed from high quality components. Built-in technology provides predictable low consumable and running costs with the highest water quality. A bypass loop provides compliant water to the analyzer in emergency situations. Water is important to different stages of the clinical analyzer process. Calibration stability and reduced assay sensitivity are a result of if the levels of certain ions are not optimal. In addition, bacterial by-products, such as alkaline phosphatase, can interfere with enzyme-based immunoassays. We also carry replacement lab cartridges, filters or lamps, such as LC141 ELGA deionization lab cartridges, LC174 ELGA Medpure deionization cartridges, LC140 ELGA pretreatment cartridges, LC136M2 ELGA composite vent filter, or the LC105 ELGA ultraviolet lamp, at The Nancrede Engineering Store.